Created in conjunction with Scholastic, the global children’s publishing, education and media company, the TurfMutt program helps students in grades K to 5 learn about science and the environment from the perspective of the backyard, community and personal green spaces they enjoy every day. The program also provides students with an understanding of how these green spaces benefit the environment when cared for in a sustainable way. To inspire kids to apply what they are learning to real life, the “Be a Backyard Superhero” essay contest offers students in grades K through 5 the opportunity to compete for a chance to win a $5,000 grant for a “green space makeover” at their school. Visit www.TurfMutt.com for rules and to obtain entry information. TurfMutt program materials are free and aligned to Science, Technology, Engineering and Math (STEM) standards. Lesson plans for teachers, take home sheets and learning activities are available. The program also offers a website and blog, interactive games and two digital storybooks. 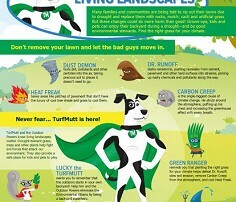 A real-life rescue dog named Lucky is the superhero, TurfMutt. A cartoonized version of Lucky is “pawing it forward” by fighting environmental villains with the help of “The Outdoor Powers,” a band of cartoon superheroes. 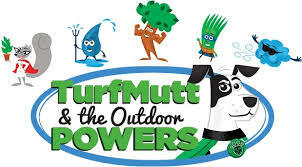 In the classroom materials, TurfMutt and The Outdoor Powers are on a mission to “Save the Planet One Yard at a Time” and they invite children to join them on their adventures and chip in. The TurfMutt environmental education program, funded and managed by OPEI’s Research and Education Foundation, has reached 62 million students, teachers and families since 2009. 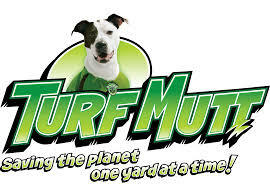 TurfMutt’s focus on environmental stewardship and best practices for water use and landscape maintenance have been widely accepted among educators, youth and families as well as listed as a resource by the U.S. Department of Education’s Green Ribbon Schools, the U.S. Department of Energy, the U.S. Environmental Protection Agency, Green Apple, the Center for Green Schools, the Outdoors Alliance for Kids, the National Energy Education Development (NEED) project, Climate Change Live, Petfinder and the U.S. Fish and Wildlife Service.